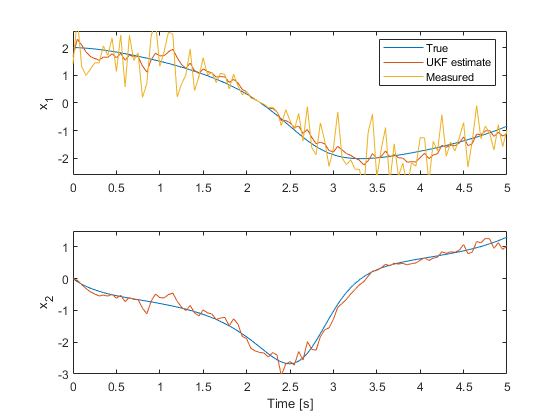 This example shows how to use the unscented Kalman filter and particle filter algorithms for nonlinear state estimation for the van der Pol oscillator. This example also uses the Signal Processing Toolbox™. Model your plant and sensor behavior. Construct and configure the extendedKalmanFilter, unscentedKalmanFilter or particleFilter object. Perform state estimation by using the predict and correct commands with the object. Deploy the filter on your hardware. You can generate code for these filters using MATLAB Coder™. This example first uses the unscentedKalmanFilter command to demonstrate this workflow. Then it demonstrates the use of particleFilter. Here f(..) is the state transition function, x is the state, w is the process noise. u is optional and represents additional inputs to f, for instance system inputs or parameters. u can be specified as zero or more function arguments. Additive noise means that the state and process noise is related linearly. If the relationship is nonlinear, use the second form. When you create the unscentedKalmanFilter object, you specify f(..) and also whether the process noise is additive or non-additive. Denote this equation as x˙=fc(x), where x=[x1;x2]. The process noise w does not appear in the system model. You can assume it is additive for simplicity. The accuracy of this approximation depends on the sample time Ts. Smaller Ts values provide better approximations. Alternatively, you can use a different discretization method. For instance, higher order Runge-Kutta family of methods provide a higher accuracy at the expense of more computational cost, given a fixed sample time Ts. Create this state-transition function and save it in a file named vdpStateFcn.m. Use the sample time Ts=0.05s. You provide this function to the unscentedKalmanFilter during object construction. % vdpStateFcn Discrete-time approximation to van der Pol ODEs for mu = 1. % Sample time is 0.05s. %   Copyright 2016 The MathWorks, Inc.
h(..) is the measurement function, v is the measurement noise. u is optional and represents additional inputs to h, for instance system inputs or parameters. u can be specified as zero or more function arguments. You can add additional system inputs following the u term. These inputs can be different than the inputs in the state transition function. This falls into the category of non-additive measurement noise because the measurement noise is not simply added to a function of states. You want to estimate both x1 and x2 from the noisy measurements. Create this state transition function and save it in a file named vdpMeasurementNonAdditiveNoiseFcn.m. You provide this function to the unscentedKalmanFilter during object construction. % time nonlinear state estimators with non-additive measurement noise. Construct the filter by providing function handles to the state transition and measurement functions, followed by your initial state guess. The state transition model has additive noise. This is the default setting in the filter, hence you do not need to specify it. The measurement model has non-additive noise, which you must specify through setting the HasAdditiveMeasurementNoise property of the object as false. This must be done during object construction. If your application has non-additive process noise in the state transition function, specify the HasAdditiveProcessNoise property as false. ProcessNoise property stores the process noise covariance. It is set to account for model inaccuracies and the effect of unknown disturbances on the plant. We have the true model in this example, but discretization introduces errors. This example did not include any disturbances for simplicity. Set it to a diagonal matrix with less noise on the first state, and more on the second state to reflect the knowledge that the second state is more impacted by modeling errors. In your application, the measurement data arriving from your hardware in real-time are processed by the filters as they arrive. This operation is demonstrated in this example by generating a set of measurement data first, and then feeding it to the filter one step at a time. 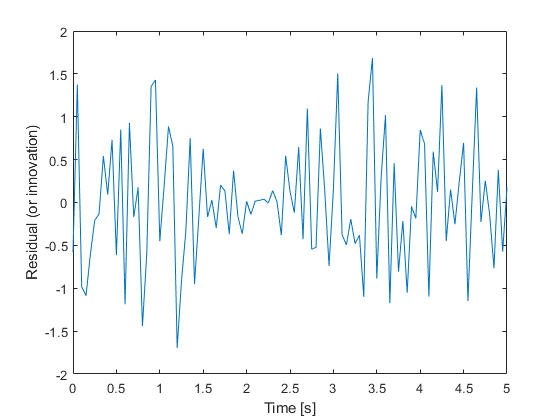 Simulate the van der Pol oscillator for 5 seconds with the filter sample time 0.05 [s] to generate the true states of the system. Generate the measurements assuming that a sensor measures the first state, with a standard deviation of 45% error in each measurement. Perform online estimation of the states x using the correct and predict commands. Provide generated data to the filter one time step at a time. % Let k denote the current time. % are also produced as the output of the "correct" command. % P[k+1|k]. These will be utilized by the filter at the next time step. Plot the true and estimated states over time. Also plot the measured value of the first state. The top plot shows the true, estimated, and the measured value of the first state. The filter utilizes the system model and noise covariance information to produce an improved estimate over the measurements. The bottom plot shows the second state. The filter is is successful in producing a good estimate. The validation of unscented and extended Kalman filter performance is typically done using extensive Monte Carlo simulations. 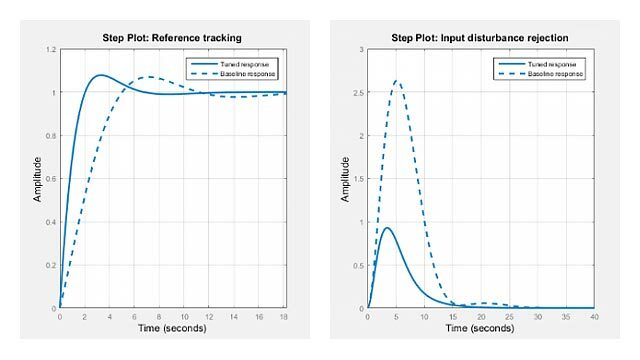 These simulations should test variations of process and measurement noise realizations, plant operating under various conditions, initial state and state covariance guesses. The key signal of interest used for validating the state estimation is the residuals (or innovations). In this example, you perform residual analysis for a single simulation. Plot the residuals. This is small relative to the magnitude of the residuals. 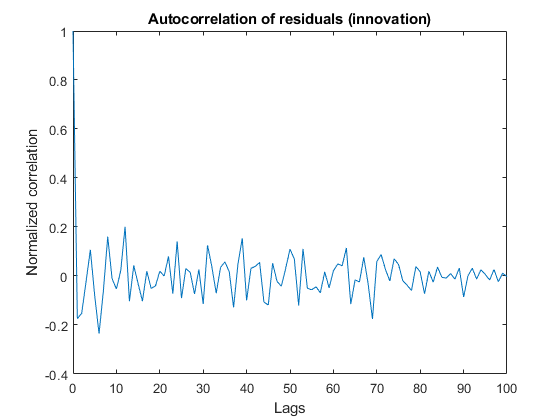 The autocorrelation of the residuals can be calculated with the xcorr function in the Signal Processing Toolbox. The correlation is small for all lags except 0. The mean correlation is close to zero, and the correlation does not show any significant non-random variations. These characteristics increase confidence in filter performance. First, look at the error and the 1σ uncertainty bounds from the filter error covariance estimate. The error bound for state 1 approaches 0 at t=2.15 seconds because of the sensor model (MeasurementFcn). It has the form x1[k]*(1+v[k]). At t=2.15 seconds the true and estimated states are near zero, which implies the measurement error in absolute terms is also near zero. This is reflected in the state estimation error covariance of the filter. Calculate what percentage of the points are beyond the 1-sigma uncertainty bound. 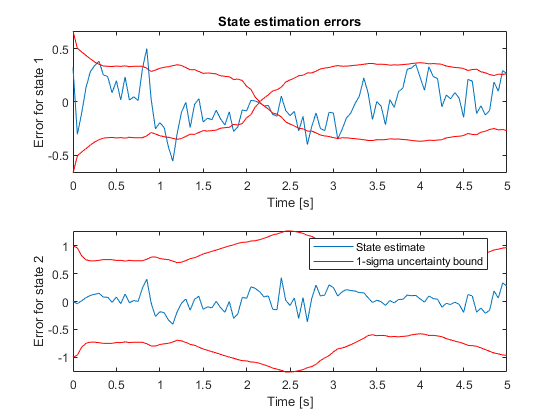 The first state estimation errors exceed the 1σ uncertainty bound approximately 14% of the time steps. Less than 30% of the errors exceeding the 1-sigma uncertainty bound implies good estimation. This criterion is satisfied for both states. The 0% percentage for the second state means that the filter is conservative: most likely the combined process and measurement noises are too high. Likely a better performance can be obtained by tuning these parameters. 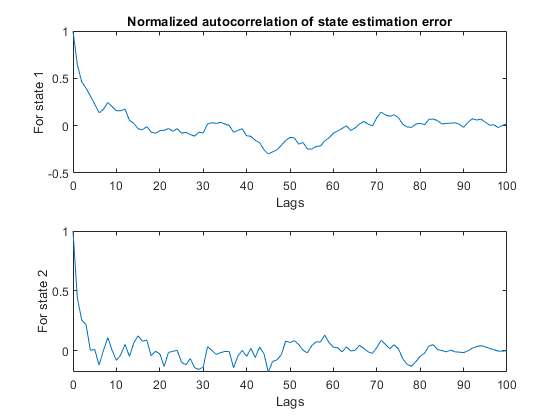 Calculate the mean autocorrelation of state estimation errors. Also plot the autocorrelation. The mean value of the errors is small relative to the value of the states. The autocorrelation of state estimation errors shows little non-random variations for small lag values, but these are much smaller than the normalized peak value 1. Combined with the fact that the estimated states are accurate, this behavior of the residuals can be considered as satisfactory results. Unscented and extended Kalman filters aim to track the mean and covariance of the posterior distribution of the state estimates by different approximation methods. These methods may not be sufficient if the nonlinearities in the system are severe. In addition, for some applications, just tracking the mean and covariance of the posterior distribution of the state estimates may not be sufficient. Particle filter can address these problems by tracking the evolution of many state hypotheses (particles) over time, at the expense of higher computational cost. The computational cost and estimation accuracy increases with the number of particles. The particleFilter command in Control System Toolbox implements a discrete-time particle filter algorithm. This section walks you through constructing a particleFilter for the same van der Pol oscillator used earlier in this example, and highlights the similarities and differences with the unscented Kalman filter. The state transition function you provide to particleFilter must perform two tasks. One, sampling the process noise from any distribution appropriate for your system. Two, calculating the time propagation of all particles (state hypotheses) to the next step, including the effect of process noise you calculated in step one. % Discrete-time approximation to van der Pol ODEs for mu = 1. %   Copyright 2017 The MathWorks, Inc. There are differences between the state transition function you supply to unscentedKalmanFilter and particleFilter. The state transition function you used for unscented Kalman filter just described propagation of one state hypothesis to the next time step, instead of a set of hypotheses. In addition, the process noise distribution was defined in ProcessNoise property of the unscentedKalmanFilter, just by its covariance. Particle filter can consider arbitrary distributions that may require more statistical properties to be defined. This arbitrary distribution and its parameters are fully defined in the state transition function you provide to the particleFilter. The measurement likelihood function you provide to particleFilter must also perform two tasks. One, calculating measurement hypotheses from particles. Two, calculating the likelihood of each particle from the sensor measurement and the hypotheses calculated in step one. % The measurement is the first state. Now construct the filter, and initialize it with 1000 particles around the mean [2; 0] with 0.01 covariance. The covariance is small because you have high confidence in your guess [2; 0]. Optionally, pick the state estimation method. This is set by the StateEstimationMethod property of particleFilter, which can take the value 'mean' (default) or 'maxweight'. When StateEstimationMethod is 'mean', the object extracts a weighted mean of the particles from the Particles and Weights properties as the state estimate. 'maxweight' corresponds to choosing the particle (state hypothesis) as the state estimate. Alternatively, you can access Particles and Weights properties of the object and extract your state estimate via an arbitrary method of your choice. particleFilter lets you specify various resampling options via its ResamplingPolicy and ResamplingMethod properties. This example uses the default settings in the filter. See the particleFilter documentation for further details on resampling. Start the estimation loop. This represents measurements arriving over time, step by step. % because StateEstimationMethod was 'mean'. The top plot shows the true value, particle filter estimate, and the measured value of the first state. The filter utilizes the system model and noise information to produce an improved estimate over the measurements. The bottom plot shows the second state. The filter is successful in producing a good estimate. 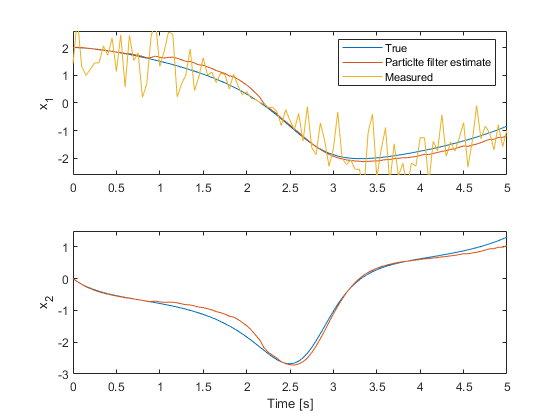 The validation of the particle filter performance involves performing statistical tests on residuals, similar to those that were performed earlier in this example for unscented Kalman filter results. This example has shown the steps of constructing and using an unscented Kalman filter and a particle filter for state estimation of a nonlinear system. You estimated states of a van der Pol oscillator from noisy measurements, and validated the estimation performance.